THE aftermath of Cyclone Debbie is starting to sink in for north Queensland residents as some prepare to walk away from their business and the region. A shell-shocked Dave McInerney emerged from the rubble of his at daylight on Wednesday to survey the damage. He spent most of Tuesday huddled in the toilet of one of the rooms with his caretaker Dave Thompson and dog Spotty. Mr McInerney said it would take a while to get his head around what had happened. "We could just hear really huge noises and that outside," he said. It was one of the first tourist spots to land in the area. But Mr McInerney said the extent of the damage caused by the category four cyclone meant he would now likely walk away. "It depends a lot on the insurance," he said. "More than likely it'll be demolished and sold as a development site. "These days it's really not worth rebuilding a small business like this." Mr Thompson said the ferociousness of Cyclone Debbie was an "eye opener". "I think I'll probably pack up and go now, that's enough," he said. "I've worked in the Gulf of Carpentaria and seen some pretty bad storms but this one took the cake." The Airlie Beach resident of 18 years said he'd had a good run, but Cyclone Debbie had been too much. "I was in room nine but the windows came in and that was it," he said. "Lucky I moved when I did because the whole back of the building came off anyway. "We just listened to it demolish around us." 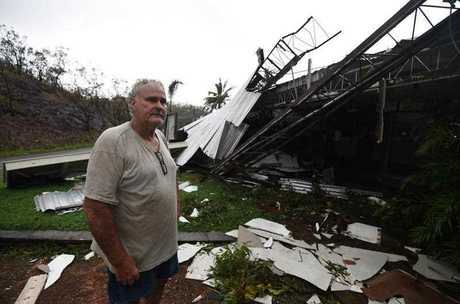 Five cyclone veteran and Airlie Beach local Steve Andrew, 56, had his roof torn apart. "I lost my business to Cyclone Ului and now my home has been busted by Debbie," he said. "This place is unliveable. I've got water pouring into the living room like a waterfall." He said the violent second half of the cyclone was among the "scariest" moments of his life. "I've never been scared like that before. "You've got to give Mother Nature full respect in a storm like that, the sheer ferocity of it. "It's still here and it's still sh---ing on us. "It just looks like a bomb has hit this place." 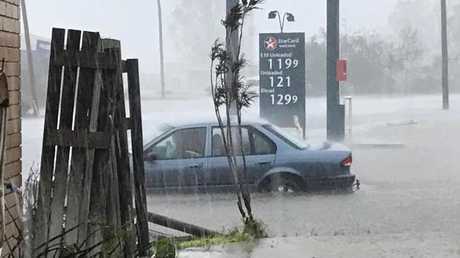 MOTORISTS are stranded in floodwater at Proserpine, amid fears 1300km of Queensland's coast is at risk of flooding. 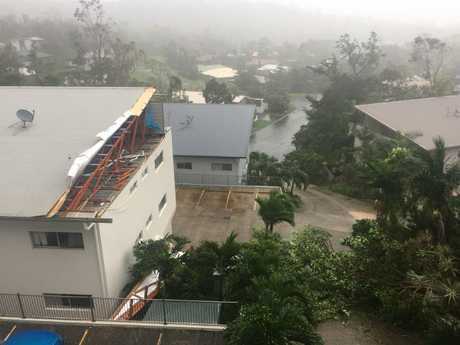 Boats are being used to rescue people from homes in Proserpine with locals still sheltering from torrential rain in damaged buildings. 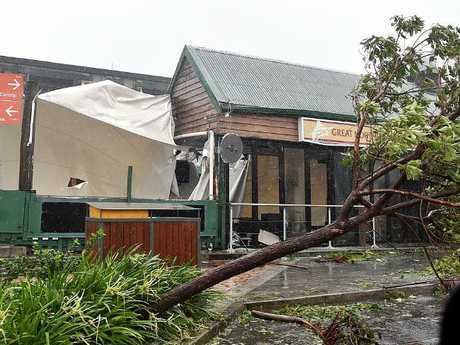 Leah Borghero, who runs the A & A Motel Proserpine, said she and her husband spent yesterday calming their terrified guests - many of them young international visitors - as Cyclone Debbie raged through the town. She said it was only this morning they were able to see just how damaged the town is. "Across the road, the roof is off and there is a rescue boat over there. I'd say they're getting someone out," she said. "The streets are flowing with water and the rain is still bucketing down." Cyclone Debbie has triggered a flood threat for a 1300km stretch of the Queensland coast, as the Whitsunday Mayor calls Bowen "a war zone". A 1300km stretch of coast from Ayr to Tweed Heads is under threat of flooding in the wake of Cyclone Debbie. Rainfall totals up to 250 mm are expected in widespread areas, with significantly higher totals possible locally. Motorists stranded in floodwater at Proserpine. QUEENSLAND Premier Annastacia Palaszczuk says residents should brace for "shock and awe" as the damage from Cyclone Debbie becomes apparent for the first time. "I think there is going to be a lot of shock and awe in the morning," she told Ten News on Tuesday evening, later admitting she was "bracing" for the dawn. "We don't know the extent of the damage. We don't know what injuries there are," she said. Cyclone Debbie was downgraded to a tropical low at 3am AEST as it weakens while moving southwest. At almost the same time, police went door to door in parts of Mackay to warn that the swollen Pioneer River risked flooding their homes, and urged people to evacuate. However, a severe weather warning remains in place and the Bureau of Meteorology says "the situation remains very hazardous". The threat of ex-Tropical Cyclone Debbie remains. Huge swathes of Central Queensland, including Mackay, Sarina, Carmila, Yeppoon, Moranbah, Clermont, Emerald, Springsure and Rolleston are at risk of flash flooding as the BOM warns between 150mm and 250mm could fall each day as the storm dissipates. A flood warning now covers much of the state with the Lower Burdekin, Don, Proserpine, Pioneer and Connors-Isaac Rivers swelling on Tuesday. The heavy rainfall will then risk flooding rivers in the south including the Warrego, Condamine-Balonne, Moonie, Weir, Macintyre, Calliope, Boyne, Baffle, Kolan, Cherwell-Burrum, Burnett, Mary, Noosa, Maroochy, Mooloolah, tributaries of the lower Brisbane, and Logan and Albert. Local disaster teams in those areas, including on the Sunshine Coast, are already preparing for the deluge. Even as a dying system, ex-Cyclone Debbie is delivering winds of up to 120kmh in the warning area that stretches from north of Bowen to south of Gladstone. As of 4.50am, there were more than 71,000 still without power, with 40,000 facing blackouts through the Mackay region and 20,000 in darkness through the Whitsundays. Emergency services had been pre-deployed to the region in anticipation of the devastation, but many were unable to respond during the storm itself. Winds of more than 260km/hour have battered buildings, coastline and vegetation across the state for the late 24 hours. Advice was for residents to simply "bunker down" for the night, staying safe and clear of windows. More than 45,000 people remain without power however many have taken to social media to document the destruction, showing backyards strewn with trees, windows blown out and resorts shattered by the force of the Cyclone. Queensland Police Commissioner Ian Stewart said the slow pace of the storm - which was travelling at a walking speed of six kilometres per hour - had created a "battering ram effect" as it ploughed across the state. "We are going to get lots of reports of damage, and sadly I think we will also receive reports of injuries, if not death," he said. Debbie hit the tiny town of Collinsville on Tuesday night, with the 1500 residents told there was "no time to move" ahead of the disaster. "It's going to be a really rough night," Ms Palaszczuk warned. She also slammed the "appalling" behaviour of those who had been seen surfing and driving in the storm. "To go out there into the treacherous surf is simply irresponsible. Honestly, why do you want to put your own life at risk and put the lives of others at risk?" she said. 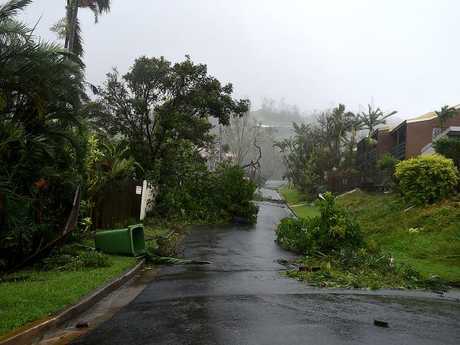 Townsville and Mackay were spared the worst of the storm, but the Whitsundays and Airlie Beach were hit badly. 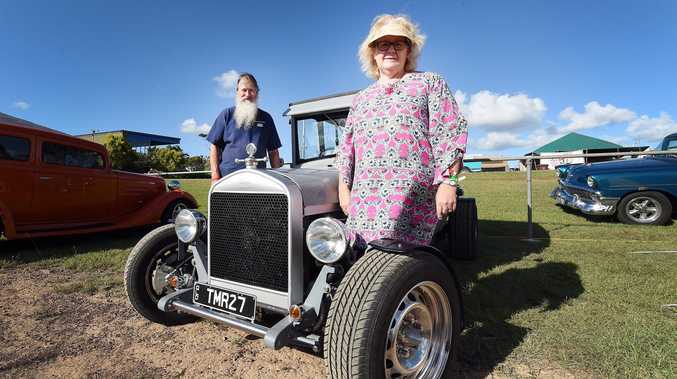 Whitsundays councillor John Collins AAP that the wind was "like a jumbo jet on my roof". "I've been through a few cyclones that are quick and nasty but this one is going to go all day. "This is going to be a terrible disaster when it is all over and done with." A Queensland woman has posted a desperate plea online after her husband went off the radar during the Cyclone when the roof blew off their home. Jenny Clarke last spoke to her husband David on Tuesday around 10am when he called to say the ceiling had caved in at their property in Proserpine. ""I'm so worried ... I can't remember exactly but he said something like 'I'm not going to win this one'," she said. Mrs Clarke is currently in hospital and fears for her husband, who has a respitaroy condition. "I'm passed the point of worrying about whether he's injured because if he had been he would be dead by now," she said. Cyclone Debbie is the largest to hit the region since Cyclone Yasi in 2014 and could cost hundreds of millions in lost tourism revenue, insurance and clean-up. Queensland Tourism Industry Council boss Daniel Gschwind said Hamilton Island and the Whitsundays generated about $700 million a year for the region. He fears images of boats ripped from moorings and hotel roofs torn to shreds by the "catastrophic" storm will deter those heading there in future. "When the images of disasters, strong winds, uprooted trees go around the world and around Australia, some people incorrectly assume that all of Queensland is shut," he said. Proserpine hit hard: "Streets are flowing with water"